1. Cut about 2-3 meters worth of Fireline cord (your arm span is just about 1 meter) from the spool. Thread a needle onto one end and then loop that end around your finger. Pull the remaining cording through the Thread Heaven enough time to coat the cord thoroughly. Thread one Metallic Matte Bronze seed bead onto the cord and slide it down until it's about 6" from the end. Take your needle go around and through this seed bead one more time. This is your stop bead. 2) Follow the pattern in the odd count peyote stitch. The only difference with odd count vs. even count is the second turn (the left side). After threading on the first row of beads (really the first two rows because of the off-set between each bead) make the turn like you would and begin to thread on the next row of beads. Thread all of the beads on this row and you'll quickly dicover that you can't seem to thread on the last bead for this row. There doesn't seem to be another seed bead to repeat the pattern to secure another seed bead here.....ah, but this is where odd count peyote stitch differs from even count peyote. Just a simple little move here solves the problem. 3) After threading on that last seed bead in the row, you see that there's a seed bead just offset and underneath to the left (or the next step down in the staircase if you like). 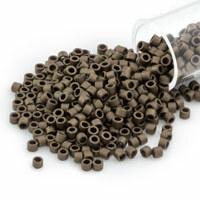 Take the needle through this seed bead from the right to the left. Thread on another seed bead (this is the last seed bead for the rown that we're working on - it will fit right into place, but we now need to secure it). 4) Take the needle down "the staircase" through the very next seed bead down and to the right of the last seed bead that you just threaded, and the next seed bead down and to the right of that one. 5) Take your needle through the seed bead (right to left) directly above the one that you just came out of (this will be the second to last seed bead that you came out of to start this whole thing off in step #2). Go down "the staircase" now from the right to left - exactly like you did in step #3. 6) Your needle is coming out of the edge of your work directly underneath the last seed bead threaded on, so to finish off this maneuver, take the needle up and through the seed bead directly above the one that you just came out of (left to right) and now your last seed bead has been secured. This X pattern is used to secure the last seed bead on the left hand side. Just remember that when you get to the second to last seed bead on the left hand side of your work, fall down "the staircase", thread on the last seed bead for that row and then fall down "the staircase" from the left to right, climb up one seed bead, fall down "the staircase" right to left, then climb up and out of the last seed bead for the row to start the new row. It will take you a couple of rows to get this down, but after that just keep remembering your X pattern, and it will all fall into place. 7) After all of your work is done, thread back down through your work so that you have your needle coming out of the fourth seed bead (the middle of your work). Thread on 28 brown seed beads, and then thread through the first seed bead threaded on for this loop. 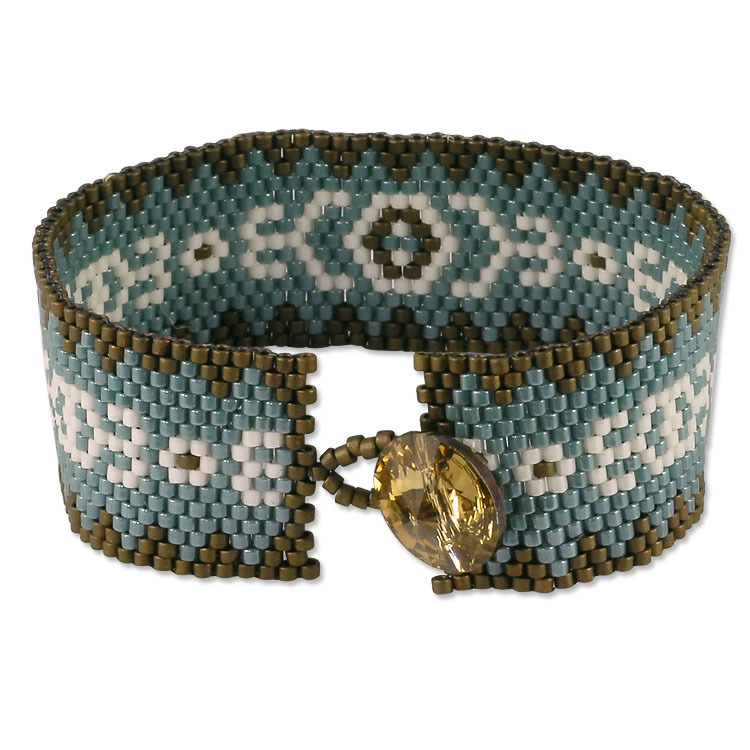 Pull tight and that first (and last) seed bead that you threaded through will fit into the space between the two seed beads in the middle of the end of your bracelet. Thread down and around a couple of seed beads so that you're coming back out of the fourth seed bead, and go through the loop one more time like you did before. After this, thread your cording down your work to the middle of the bracelet. Some people like to thread their way to one of the sides of the bracelet and simply pull the needle off the cord; no knot, just burn the tail off close to your work with your Thread Burner. Others like to put a knot in their work and burn off the tail, but this can only really be done on the edge of the work - you can really make a space to create a knot between the beads after they're threaded together. This part is up to you, as your work should hold either way as long as the work itself is pretty tight. 8) With the 6" tail at the other end, thread on the needle and thread into your work about five rows from the edge and coming out just off to the side of the middle of the bracelet. Thread on the button and go through the button loop two to three times. Pull tight and then secure by going through the other side off of the middle of the bracelet (the button should be sitting right in the middle of the bracelet about 5 rows from the edge). 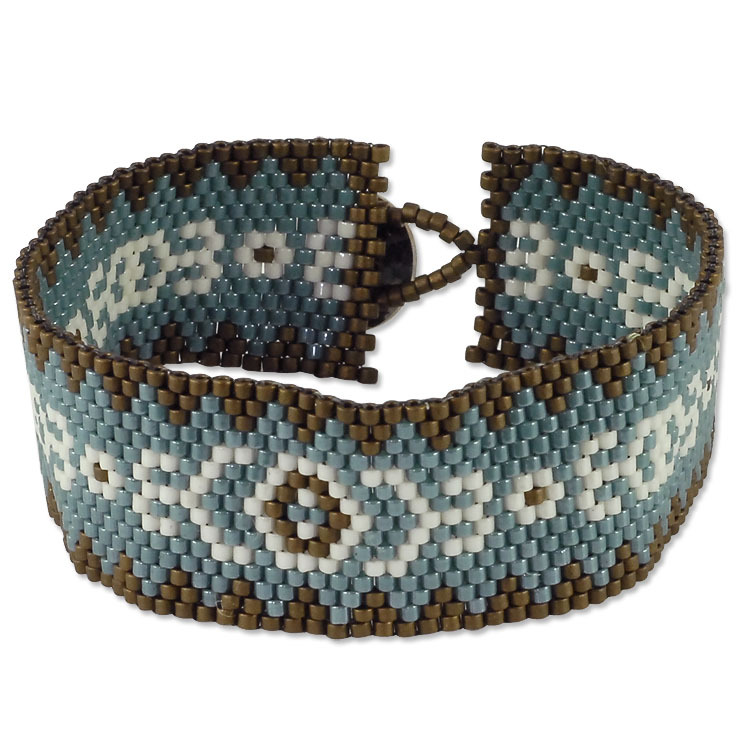 Same as before, take your thread through different seed beads in a zig-zag pattern until you reach the middle of your bracelet. Thread your way to one of the edges, and either pull the needle off the cord, and burn off the tail, or create a knot before burning off the tail.